I had been meaning to read Truman by David McCullough for years, but what finally compelled me to read the bio was a biography of Wild Bill Donovan by Douglas Waller, which I reviewed earlier. Though he appears only briefly in Waller’s book, the well known no-nonsense style and common sense of Truman as portrayed in the book captivated me enough to commit to reading Truman when I finished the Donovan bio. Many of Truman’s accomplishments and Horatio Alger rise are well known and require little elaboration. 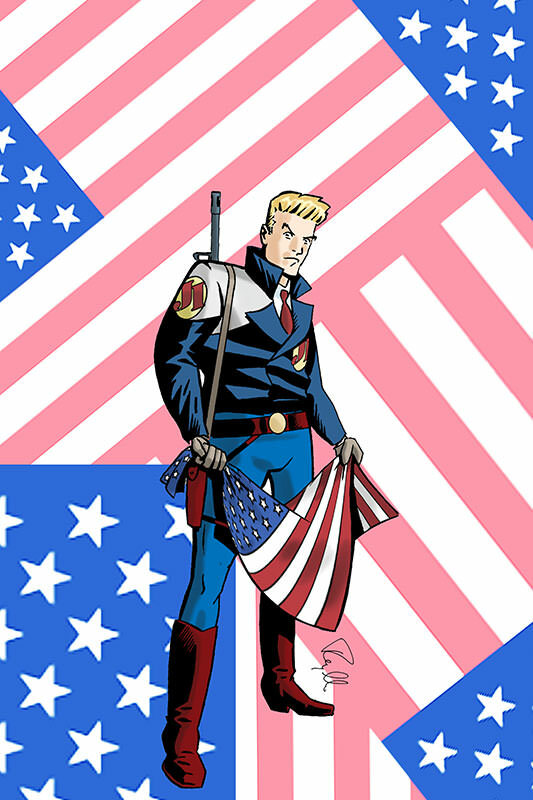 He was indeed as “common” a man who ever occupied the White House, embodying the uniquely American belief that anyone could become president. He was a college dropout (for financial reasons), a reluctant but committed farmer, and a failed haberdasher and businessman, who first found his footing and penchant for leadership as an artillery officer in World War I, serving despite being over age and poor eyesight. His one great passion was politics—a family preoccupation—and he soon found himself involved in local politics, then U.S. Senator, then Vice President. Though it’s not clear whether the party bosses (and President Franklin Roosevelt) understood that they were choosing the next president by selecting Truman as vice president since FDR’s failing health was by then an open secret in Washington, DC, Truman clearly rose to the occasion and then some. One of the most remarkable revelations for me was that he was the product of one of the most powerful political machines in the country in Kansas City, Missouri. Though Truman was beholden to its boss, Tom Pendergast, through much of his career, there’s little evidence that Truman ever compromised himself, a remarkable feat, despite the attempt by rivals to use this association against him. (Indeed, while reading the biography, I wondered whether the corrupt senator in Frank Capra’s 1939 film, Mr. Smith Goes to Washington, was partly based on Truman. In the film, Claude Raines plays a senator who is in the pocket of a corrupt political boss and bears a resemblance to Truman.) True to character, Truman remained loyal to Pendergast to a fault and never denied his connection to the man, causing a minor stir when he attended Pendergast’s funeral as vice president. Perhaps not as revelatory is the portrayal of the Soviets in the book. Truman was truly committed to avoiding another world war and finding a way to peacefully co-exist with the U.S.S.R. Indeed, though Truman was always realistic and clear-eyed, he thought he would be able to reasonably negotiate with them. Indeed, he admitted both privately and, occasionally publicly (to much derision) that he personally liked “Uncle Joe” Stalin and at least could see where he stood. Over time, however, Truman came to realize that the Soviets thrived on instability and were expert at exploiting uncertainty, so he eventually came to recognize and accept the reality of the Cold War. 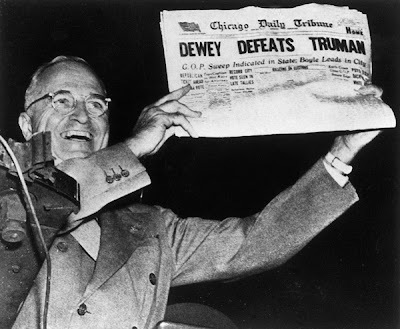 Also fascinating is the discussion of Truman’s “surprise” victory over challenger Thomas A. Dewey in 1948, which resulted in the iconic “Dewey Beats Truman” flub headline in the Chicago Tribune. With polling still in its infancy, the book shows that Truman may not have been as far behind as common wisdom (and the press) assumed. Truman did build momentum on one of the last great train whistle-stop campaigns of its kind, but it’s clear that his support in rural areas was greatly overlooked and underestimated. Dewey also did himself no favors by coasting and playing it safe since the polls had him so far out ahead. But ultimately the book notes that, still in its post-war boom, the U.S. was experiencing unprecedented growth and prosperity. So while there was some fatigue given Truman was seen as an extension of FDR’s unprecedented 12 years in office, it’s likely voters asked themselves, “Why rock the boat?” and decided to stay with Truman. What’s striking about Truman was his genuine Capra-esque trust in the wisdom of the people and the common man. 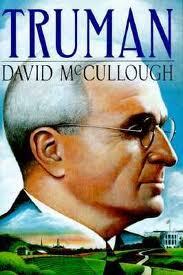 McCullough notes that Truman in his manners and values was essentially a 19th century man. He was also a fervent Democratic partisan and the product of staunch Confederate southerners—yet Truman’s vision, principles and values enabled him to rise above the provincialism and prejudices that were part of his environment and upbringing. Though in private his language and remarks could reveal the kind of easy racism that made him to be a product of his time and place, he nevertheless became an early champion of civil rights (even though it seriously threatened his chances of re-election, he refused to back down on his civil right positions and was the first president to address the NAACP, which he did at the Lincoln Memorial) and at every State of the Union he always proposed universal health care. Truman tells the remarkable story of a common man.